After a long week I finally had an opportunity to sit down (write my blog) and relax and allow my body to recover. February started out well with trying to stay in shape and exercise daily. Monday I had the opportunity to do Gentle Flow Yoga in the morning and hopped on the trainer for an hour that night, Tuesday was an off day and spent doing school work. Wednesday was my first day of Hot Yoga which was a world of difference from Gentle Flow, instead of a warm room Hot Yoga is set at 104 degrees and the duration is 1:15 instead of 1:00. I really enjoyed the workout and planned on going back for more today until I received an email saying today's class had been canceled due to inclement weather. Thursday was running with the TriAdventure group and while it was nice to get out and have structured workout I didn't really gain much or even feel that I was pushing hard, then again it was the first week and the course is aimed at beginners. Garmin Connect Activity Data for Thursdays nights track workout. Today was nice because classes (which I don't have) were canceled and almost everyone choose to stay cooped up in their dorms. 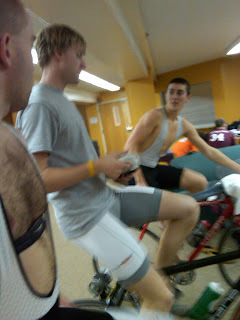 One advantage of classes being canceled was that I had the opportunity to ride with 2 other guys on the Tech Cycling Team . We did the SpinInervals Hill workout DVD which was straight out of the 90's but still pretty tough and provided for some good entertainment. We set up camp in the 2nd floor lounge of their dorm and went to work. Now more important than riding and getting back on the bike, was the amount of dedication it took to carry all of my stuff (trainer, shoes, water bottles, towel, nutrition, and my bike which I didn't want to get even more dirty so I shouldered it the entire way) over to their dorm and then rode. 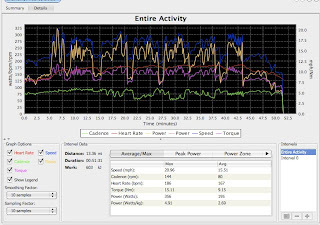 Power Data from tonights ride! Hoping to get some more quality training in before our first race next weekend at N.C. State. 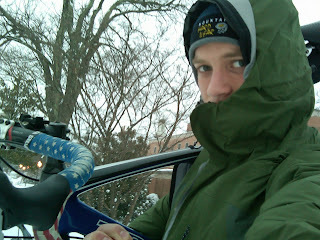 Posted by Unknown at 5:55 PM I'm reading from MyDailyGround: 1st Week TriAdventure Recap Tweet this!